Google Anita Borg Memorial Scholarship was launched in 2004 in honour of Late Dr. Anita Borg who believed that technology affects all aspects of our economic, political, social and personal lives. Google Anita Borg Scholarship supports women in Computer Science or a closely related technical field. It encourages women to excel in computing and technology and become active role models and leaders in the field. 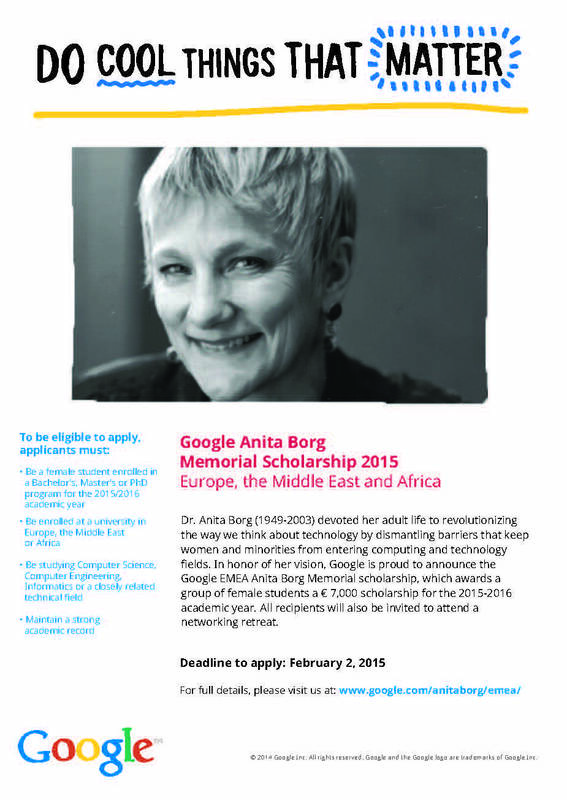 Google Anita Borg Memorial Scholarships are offered in Africa, Asia Pacific, Canada, China, Europe, Middle East, and the United States. To apply for the scholarship the candidates also have to submit solutions to three essay questions in the language they are more comfortable in. From the applications received, a group of female undergraduate and graduate students will be selected. Scholarships will be awarded based on the strength of each candidate’s academic background and demonstrated leadership. All the selected female candidates will be offered a financial award for the academic session by Google. Be a female student admitted as an undergraduate or postgraduate course in the 2018-19 academic session. Candidates can apply regardless of their citizenship. Kindly Note: Candidates studying at a polytechnic or institute of technology and it awards the university-equivalent, three-year, bachelor's or postgraduate degree, are also eligible to apply provided they meet all the above-mentioned eligibility requirements too. Prohibited by applicable export controls and sanctions programs. Attend Google Scholars Retreat: Selected candidates will be invited to attend the annual Google scholars' retreat in the Google Shanghai office from September 2 to September 2015. Step 1: General background information: Candidates are required to fill in the contact information and information about their current and intended academic for the 2015-2016 school year. Step 2: Submit Resume: Candidates have to upload their resume in the language they feel most comfortable with. Step 3: Academic Records: Candidates have to upload Academic transcripts of their current university and past institution is currently in graduate school. Format: Candidates have to upload the transcripts and resume into an electronic PDF format. Soft Copy of Official Transcripts: Candidates have to submit a soft-copy of official transcripts while applying Online. If in case the school has not issued the official transcript before the deadline, candidates can submit an unofficial transcript provided that the official transcript is submitted at a later stage. Current Degree Transcripts: Candidates are only required to submit their current degree transcripts. Academic Strength & Leadership: The candidates will be selected on the basis of their academic background and demonstrated leadership. Essay Answers: Responses to three essay questions in the language they are most comfortable in will also be considered for Selection Process. Verification of Enrolment: Candidate’s enrollment in the University will be verified after the winners are selected. The scholarship payments will be made directly to the student to be used towards tuition and education-related expenses.